In the studio, I have three more commissions to finish for Christmas, I will share these as I can. Kids are home from school and don't want to lock myself in the art room while I still have their undivided attention.....so.... 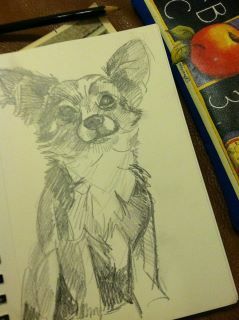 I am multi tasking, working on organizing ideas for my little studio and sketching puppies while we watch Christmas movies. busy, but.... Life is good! Sounds like you have a lot to juggle! Great drawing! Maria, it all sounds most busy - happy but busy. Your sketch is adorable - glad you had time for that! Thanks Kathryn, I am taking Crystals tip, sketch, sketch, sketch, I always have time for a quick sketch! 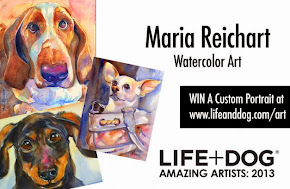 You really are so talented and I just love your watercolor touch! I so long to start learning and getting back to my art. I would love to just be half as good as you are. Oh thank you Margaret! I think I am truly addicted to this painting thing and you are encouraging my habit! And I just love your work, your drawings and paintings are amazing, and I am inspired by the photos that you take. So beautiful. Glad that we are able to be encouraged by each others progress! Carol, I love to sketch (or knit) while I watch TV, too hard for me to sit and not be doing something! I am still a licensed vet, but haven't been working since the kids were young, keep thinking I will go back to work, but am having an awful lot of fun painting in my free time. I think I need a few more lifetimes to complete everything I have in mind....(yikes....does that qualify me as an overachiever!?) Glad you like the sketch though.